I realise it has been a while since I last wrote on this blog. I miss reporting and I miss you all so much - especially those contributing in making NHA grow and become more interesting. I've been very busy working, implementing the care and aid that you, through Nazareth House provides for the people of my country. So much to say but I will start with just a few words, and they are actually words of prayer for you all supporting the Nazareth House Apostolate Cause here in Salone (Krio for Sierra Leone). You won't expect me to jump straight to the activities coming up this year 2009 without first mentioning the last days of the year 2008, would you? As the old year rolls out and the new year slides in; there is so much to reflect on. With your help and support a whole lot has been accomplished. We now look forward to reaching more of the lost, more of the sick, more of those clothed in rags and to make bigger and better differences in the lives of those who are our brothers and sisters in God. Customarily for NHA, our first priorities are to pray and to love each other and to bring smiles to those who think there is no need to smile. I guess you've all had a visual taste of the tiny red and white stuff called candy canes that Nazareth House has been spreading around Salone. Not all are fortunate to have it but we at NHA have been making it possible for hundreds to have a taste of it for at least once a year. This time round, our thanks goes to Carlos & Pat Portuondo ( Milford, Connecticut) who kindly provided it for distribution to our kids in memory of our dear friend, Fr. Bob Haux. 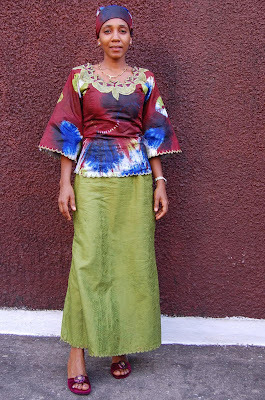 Sorry to say it took more than a month traveling in post to get here but it did come, Better late than never - and as Mama Vicki said in earlier blog posts, its usually around the time for dusty Harmattan. No matter when they come, the kids are extremely grateful and happy. 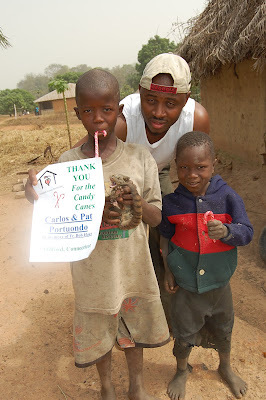 As usual, Roo, Lucy, and Ann Marie were the first to get a bite of the peppermint canes, followed by a handful of kids at Godrich village, and then on to one hut village before reaching the final destination at the Nazareth House Kabala School. 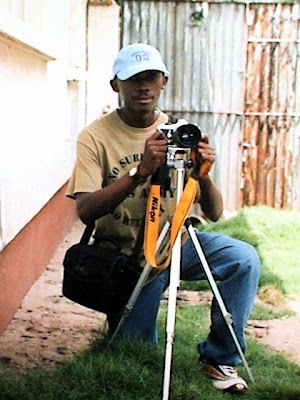 My gratitude to a young man, Alie Jalloh from USA who was here to help me do it all. Alie was a bit shy to enter into the hut at ONE HUT VILLAGE. It is so different from his life now in America. Once inside, Alie got a good memory of what it is like to live in a hut such as this and now with these photos you can experience life in a mud hut, too. Notice the simple but strong bed made of wood (Alie must have thought his weight would break it, but it is very sturdy). Click on the photo to enlarge it and you will see that this village is using its Mosquito Netting that Nazareth House Provided last September. Mohammad seems a bit thin, I think next visit we should concentrate on more food supplies for this village. 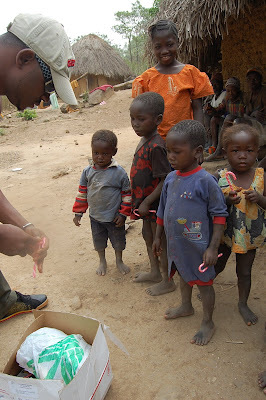 Mama Vicki treated everyone at One Hut Village for internal worms and from the kids bellies we can see some improvement but we will need another treatment for them soon. Once back out of the hut, Alie gets back to handing out NHA candy canes. It doesn't take long before the kids are sucking down the sweet minty sticks. A treat they have never experienced before. Thanks Pat & Carlos and thanks to all of you that make it all possible to do this work. 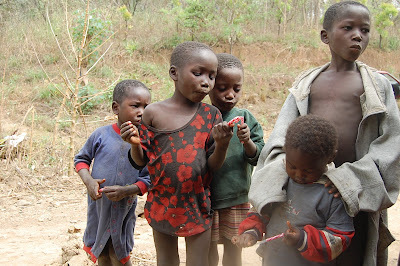 It is a team work, the candy, the funds to make the trip, the other supplies we carried on this trip. NHA has the best team and the best cooperation. Thank you all. 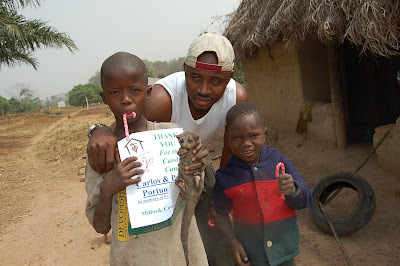 As James and Alie Jalloh(from the United States) traveled towards Kabala to distribute the candy canes for the students at Nazareth House Kabala School, they stopped at various villages to hand out candy canes to the children. You never know who or what kind of creature will greet you as you happen upon a town or village. I can attest that most of the time, despite finding some sad conditions, every stop at every village you meet up with a new experience and you leave with new friends that will forever take up residency in your heart. I am sure that Alie is experiencing just that as he journeys from village to village with James. Here Alie meets up with some children and their pet "bush cat". The strong peppermint/wintergreen aroma from the candy canes tends to disturb the little critter. 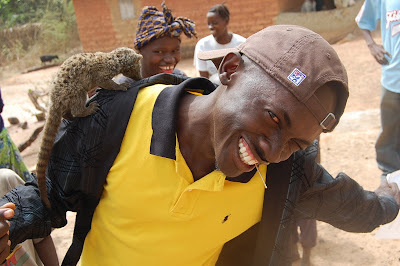 However, a walk on James' shoulder tends to calm the creature - although James' seems a bit apprehensive about the whole idea of a bush cat climbing up his sleeve. In fact, in a phone conversation to me James told me "Mama, I was scared!" Becoming accustomed to the smell of candy canes and lips loudly sucking the sweet candy, the bush cat becomes content and poses for the camera with the children. 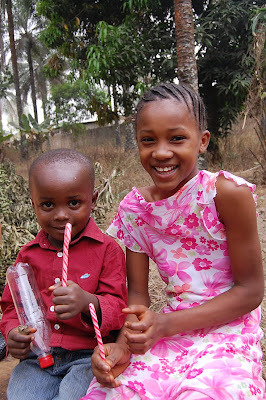 one child after another receives a special treat, a candy cane. 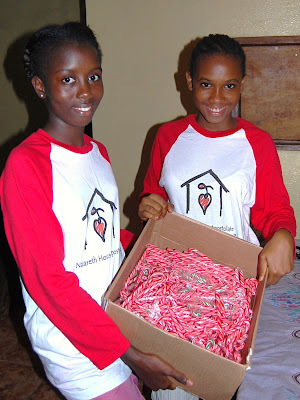 The students at Nazareth House Kabala School anxiously wait for their candy canes to arrive. 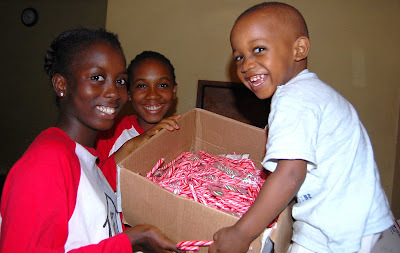 The picture below is of the students receiving their candy canes last year. Be sure to note the difference when you see the students this year receiving the candy canes. These pictures will be posted in the next day or so. 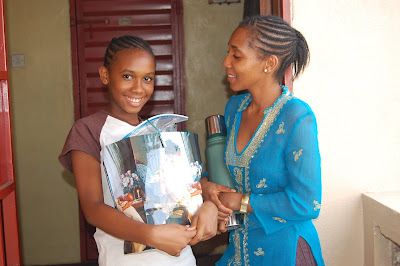 When you see this years photos, notice that the students now have school uniforms and a school building - thanks to Nazareth House Apostolate and those who support its endeavors to aid and assist the lives of those in Sierra Leone. Each year, shifting winds known as the Harmattan head southward from the Sahara Desert. As it darkens the skies with sandy grit, the dry air also makes for some really cold nights for the people of Sierra Leone, who are used to blustery equatorial weather. The dusty wind can be severe enough to ground airplanes & helicopters. Because of the extremely chilly nights and the dust that aggravates the lungs, most in Sierra Leone see this weather condition as a great nuisance. But for others it's a business opportunity. 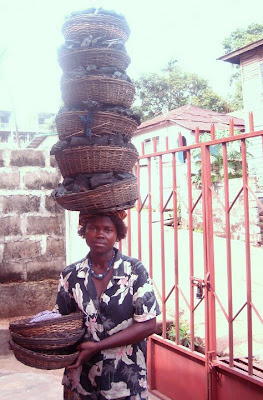 Charcoal vendors move their product to buyers seeking nighttime warmth. No matter when Nazareth House Apostolate sends the Annual Candy Cane Treats, it seems they always arrive about the time of Harmattan - when dust in the air coats everything...and everyone. 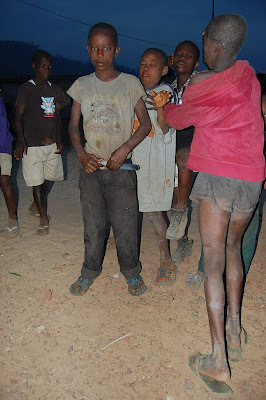 Notice the dust on these children. You could write your name in the dust on the little boy's belly. Candy Canes and Dust do not make the best combination, but to these children, a few extra gritty particles really didn't matter. 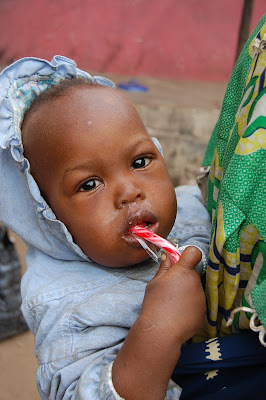 A candy cane is such a special treat. 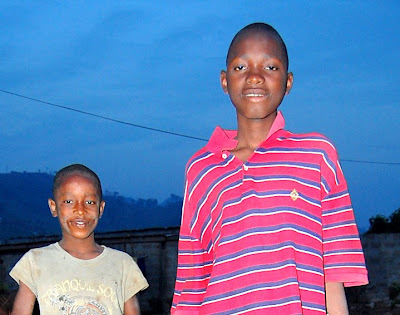 James and his friend Ali recently made the trip from Freetown to Kabala for the annual distribution of candy canes to our students at the Nazareth House Kabala School recently. 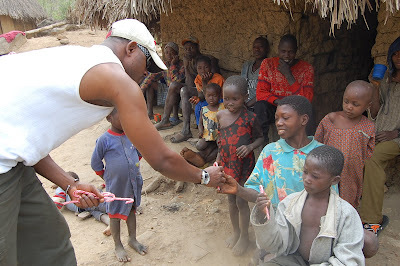 Along the way, they handed out candy canes to the children they met as they passed village after village. 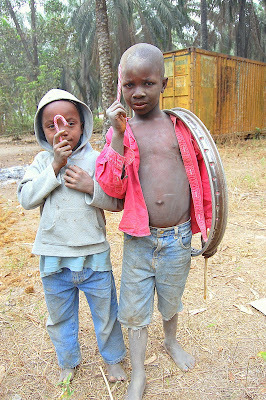 The young man on the left is sporting a Harmattan dust covered face with a shiny sticky circle around his mouth, evidence of a well licked candy cane!!! 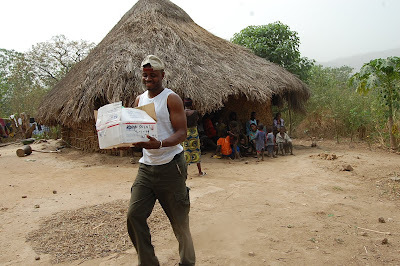 You who are filled with love and compassion for the people of Sierra Leone, are able to express this through Nazareth House Apostolate who delivers that love into a tangible reality. What a team we all are in Nazareth House. Thanks for your support... and the difference you make in the lives of so many... Have a wonderful day! 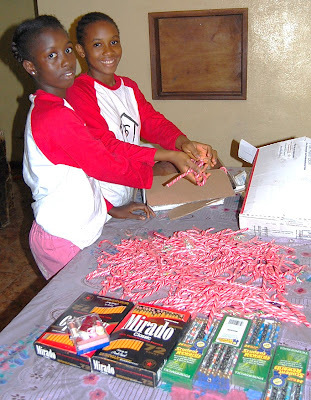 The students of Nazareth House Apostolate School in Kabala, Sierra Leone have become accustomed to their annual Candy Cane gifts that we hand out each year. They have been anxiously waiting their arrival. Mail can be slow during Holiday time, but I am happy to report that the Candy Canes have arrived. 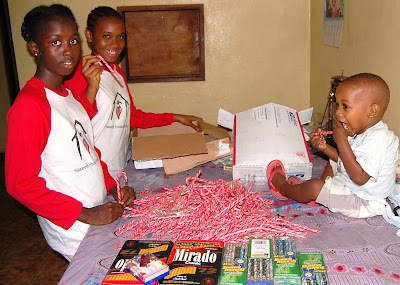 This year the candy canes along with pencils were given by Pat Homola-Portuondo and her husband, Carlos from Connecticut. (click on photos to enlarge) Enough candy was given for each of our students at NHA Kabala School and also there is plenty to hand out in Freetown, as well. The box barely opened, you can see Roo is eagerly cramming one into his mouth, already! The gift was given in memory of Fr. Robert Haux who had originally planned on providing the candy canes. Candy such as this is a rare and special treat... as you can see by the huge smiles on Lucy, Ann Marie & Lil' Roo's faces. 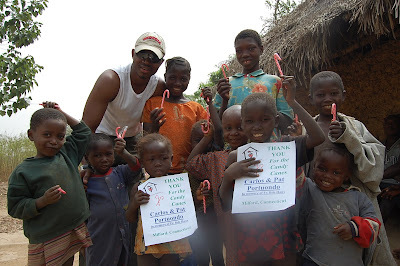 When James has regained his strength, he will take the candy canes, pencils and go to Kabala to distribute them. And then, we'll see more happy faces. Thanks Pat & Carlos, what a fantastic gift! One by one we are experiencing some recoveries from recent illness. In Sierra Leone, James is feeling much better after discontinuing a medicine he received in Freetown which was supposed to be for malaria. Apparently, it is very strong and it knocked James out, keeping him unable to get out of bed. He is doing much better now. 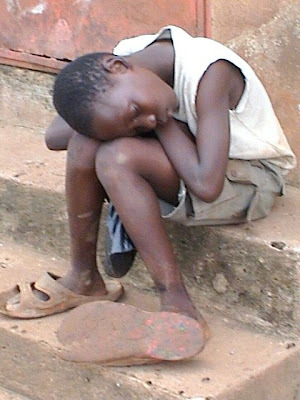 Unfortunately, NHA has not been able to provide malaria medication at this time and he obtained the medication at a local Freetown pharmacy. Here in the States: Mary Langseth, in Louisville had surgery to put a pin in her arm, yesterday and she is doing well. Sweet little Chloe in Georgia is scheduled another platelet test on Friday. Fr. Seraphim's broken hand has some signs of swelling but it seems to be healing. Beth Ridder's mom is "hanging in there" and responding to treatment. 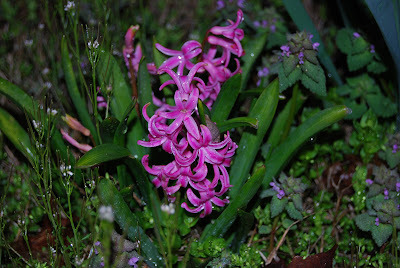 Rejunvenation, Spring...Bring it on!!! A lot is going on in Sierra Leone as we draw closer and closer to our deadline to be expelled from our current residency in Freetown. We have not put much of a dent in raising enough funds to purchase our own place... so we pray and we ask you for your continued support. This is such an important work and we are all a part of it. Spread the word. 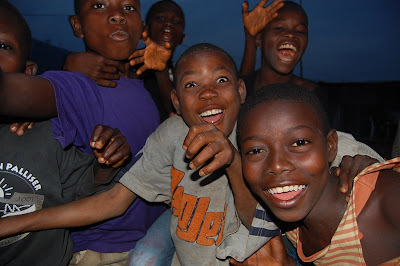 Tell them what you are doing in Sierra Leone and invite them to join you in making a difference. Let's give James a few more days to bounce back into shape and we'll have more current pictures and reports from Sierra Leone back up on the blog. Until then, please keep checking back and remember to keep NHA and the people we all serve together - the people of Sierra Leone - in your hearts and minds. Share your work through Nazareth House Apostolate with others.... lets work hard to continue the work. Please forgive our slow posting of late, it seems we've been bombarded with some illnesses both in Sierra Leone and in the States. 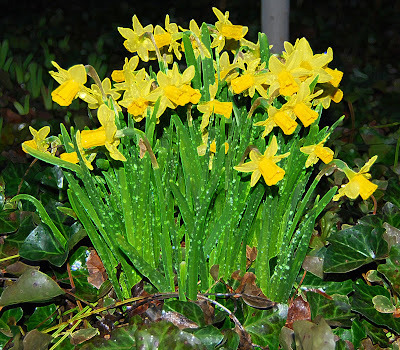 As 2009 moves forward; We thought we'd share a few memories of Spring 2008 - something to look forward to while we all work hard at healing (and for some of us: THAWING). 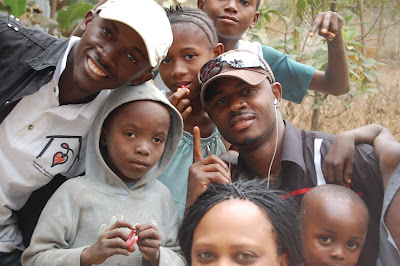 Especially keep James in Freetown in your prayers as he recovers from a severe case of malaria and the flu. Thank you. See you soon, keep checking back. 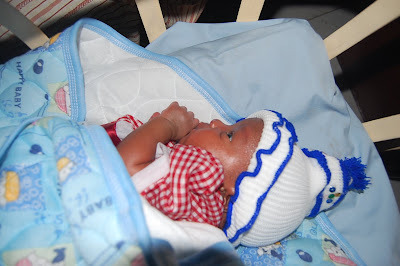 Nazareth House Apostolate is pleased to announce the birth of this precious little boy in Freetown, Sierra Leone. Mom (Binta) and baby are doing well. Dad, Anthony, is making his way to Freetown to reunite with his wife and baby. Unfortunately, poor dad was stuck in Makeni during the birth. As is the custom, Anthony will also name the child upon his arrival. In the name of Nazareth House and St. Laurence House, Kadijah and Lucy, together with James, brought gifts to officially welcome the new child. This is such wonderful news, not just the birth, but that a timely c-section was performed successfully shows progress being made. Thank God! Have a great Tuesday, everyone!